May 13, 2013 by Verle L. Bell, M.D. Go to psalms 51 and to the story of the faithful father in the new testament in Luke 15,11-32. Study these examples of repentance and you will come out with something like the following tool. When I sin: 1God is the one sinned against. 2. I “shoot myself in the foot” and am the one damaged 3. I place a stumbling block in front of the injured person. 4. I give occaision the the enemies of the Lord to blaspheme. 5. I bring inevitable difficulties into this world. I. God is convicting me of my bad attitude of __________________. (ex. pride, control, competition, , greed, lust, anger, envy, etc. V. Because I know that I could mess up again, I am obtaining the following accountability and help__________. I am getting help because I need it not just to get you to drop my consequences and I plan to continue for as long as it takes for God to change me. 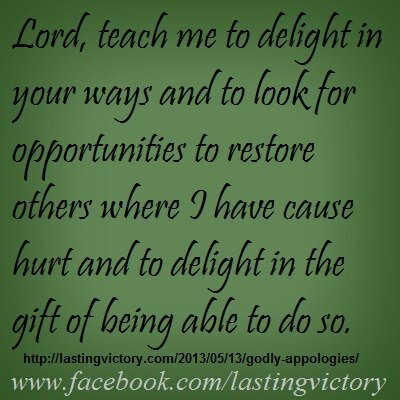 LORD TEACH ME TO DELIGHT IN YOUR WAYS AND TO LOOK FOR OPPORTUNITIES TO RESTORE OTHERS WHERE I HAVE CAUSED HURT AND TO DELIGHT IN THE GIFT OF BEING ABLE TO DO SO. This entry was posted in Uncategorized and tagged Bible, Christianity, faithful father, Forgiveness, God, HOW TO: outlines on godly living, Jesus, Relationships, trustworthy relationship, WEAPONS OF WARFARE. Bookmark the permalink. ← WHO’S THE OWNER ANYHOW?